Forget the upscale remodel. You can get a whole new look for a few thousand dollars. NEW YORK (Money) -- You're longing to replace those dark oak cabinets, avocado appliances and worn countertops in your kitchen. But the $50,000 to $100,000 price of a high-end renovation and the thought of living on kung pao for three months during construction make you queasy. Plus, in today's buyer's market, a full-scale renovation doesn't return what it used to: in 2006, home sellers got only 80 percent of their kitchen remodeling costs back, according to the National Association of Realtors, down from 91 percent in 2005. 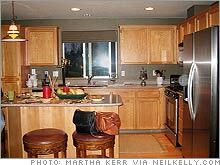 Refacing the cabinets and adding a new floor was all it took to transform this kitchen. But that doesn't mean you have to live with a tired look forever. As long as the layout is good and the cabinets are sturdy, you can transform a kitchen for just $1,000 to $10,000 by dressing up what's already there. "And you'll probably see a dollar for dollar or better return on the investment when you sell," says Baltimore home appraiser Terry Dunkin, who is president of the Appraisal Institute, a professional standards organization. Keep to neutral colors such as white, cream or beige and natural materials (like wood and stone) so the results won't soon go out of style. You may also want to hire a professional kitchen designer ($250 to $500) to help you choose colors, products and materials that look good together (check nkba.org and asid.org for certified designers who offer hourly rates). Then pick your projects according to your budget and your priorities. Replace the ceiling fixture There's no reason to live with an ugly ceiling light that causes eye-strain. For $25 to $250 you can buy a simple fixture that matches your cabinet hardware. If you aren't confident in your knowledge of electrical wiring, it's worth it to spend $200 to $300 to hire an electrician to do the work. Put in laminate flooring If your kitchen floor is level with the floors in the adjacent rooms, you can make old linoleum, sheet vinyl and chipped tiles disappear by installing laminate flooring right over them. Laminate costs $1 to $5 a square foot and looks like wood, stone or tile, but it's actually photographs of those materials under a clear plastic wear surface. The pieces snap together without nails or glue and are a cinch for handy homeowners to install. Give the cabinets a new life Spending $3 to $10 or so a cabinet to replace shiny brass knobs and pulls with brushed nickel will instantly modernize their look, says Martha Kerr, a 30-year-veteran kitchen designer in Portland, Ore.: "Or have some fun with colored glass, retro 1950s plastic or little metallic vegetables." Just make sure that any hardware you select matches the existing holes. As long as your cabinets are solid, a new coat of paint will make them appear fresher. While you're at it, you can install doors with wood, leaded glass or punched tin panels ($50 to $150 or so a door) and paint the frames to match them. Or eliminate some doors entirely for an open display look (free). You can fill unwanted hardware holes (use Bondo, the autobody filler) before painting. Refinish the appliances If your appliances sport a dated color, send them to an appliance refinisher (look in the phone book for a local shop). For a few hundred dollars (about $150 for a stove door; $250 for a whole refrigerator), they will re-enamel the surfaces in the hue of your choice, such as black, stainless steel or barn red. Reface the cabinets You can get a gorgeous new maple or cherry finish for your old cabinets by hiring a refacing company to replace the doors and drawer fronts and cover the cabinet boxes with a matching veneer ($4,000 to $6,000). "That's less than half the cost of new cabinets," says Dave Haglund, president of Kitchen-Tune-Up, an Aberdeen, S.D. 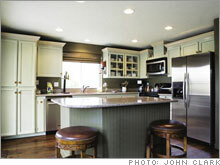 refacing and remodeling company. Another benefit: While replacing the cabinets will take two to three months, a complete refacing job can be done in three days. Refacers can also install additional cabinets, resize appliance openings and replace the countertops as part of the job (add one day and $3,000 to $6,000). Update the backsplash A four inch- high band of laminate or tile above the sink makes your kitchen appear outdated, says Richard Gaylord, a Long Beach, Calif. realtor and president-elect of the National Association of Realtors. Replace it with a full backsplash that fills the 18-inch space between the counter and the upper cabinets (don't worry, it need not match the countertops). In fact, you can use that space for some do-it-yourself creativity; try using tiles of colored glass or stone ($300 to $750 for the entire backsplash in an average-size kitchen), wallpaper ($50 to $100), beadboard paneling ($100 to $150) or tin ceiling tiles ($400 to $800) to fashion the look you prefer. Add new lighting If your kitchen has a single ceiling light, it probably casts an annoying shadow over the food whenever you cook. An electrician can add a few recessed ceiling lights ($300 to $500) to brighten the entire room and under-cabinet lights ($200 to $400) to illuminate the work surfaces. Uncover the wood floor Most houses built before World War II have wood floors hiding under the linoleum, and there is no better floor for a kitchen, says Sandy Gordon, an interior designer in Madison, Wis.
"It's gentler underfoot than tile and more forgiving on dropped dishes, and today's finishes are superdurable." If you're not comfortable ripping out the old layers of flooring, sanding the wood and applying polyurethane, you can hire a hardwood flooring company to do the job for about $5 to $7 a square foot. Replace the appliances New appliances will make your kitchen appear more up to date and will also improve its ergonomics and energy efficiency. Buy moderately priced equipment ($2,000 to $10,000 and up for a refrigerator, range, microwave and dishwasher) in stainless steel for a modern look. If you can't resist that $10,000 stove, consider taking it with you when you move. Whatever you decide to do, keep in mind that just a week of an all-takeout diet will add hundreds more to your renovation costs. So before you get started, set aside some essential foodstuffs, perhaps a microwave, a mini-fridge and - most important - the coffee maker.